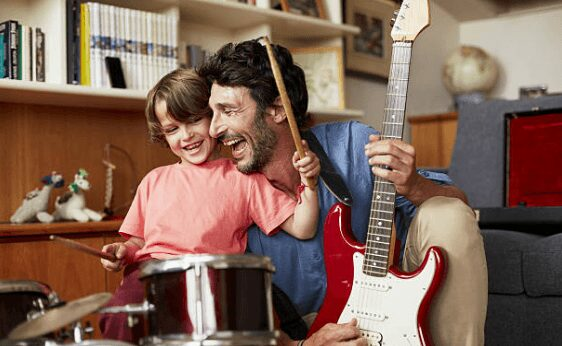 The time has come to get the little one playing musical instruments and why not the drums? Learning the drums and playing music is a great way for toddlers and children of all ages to begin a creative learning process. Some parents worry unnecessarily about the noise and potential disruption it’ll make, but I am here to say don’t worry, toddler drum sets are not like others you might have seen on TV or YouTube. They are far less noisy and in comparison, they will not disturb the neighbors like a fully-fledged drum kit that is meant to fill stadiums and rock concerts are. This three pad set of drums has its own unique look and sound with a cymbal that looks like a UFO. The toddler Vtech kidibeats set is small enough for children aged between 2 and 5 years old, but it wouldn’t surprise me if younger children also use it. There are some parents who said they used it with their 1-year-old and although they didn’t understand the concept they were still enjoying the sensory learning experience. This is 9 melodies and has easy to use buttons for on/off functionality, but sometimes parents forget to realize that you can change the settings if one particular sound starts to get annoying. The sounds vary from pop to rock and each has music to teach letters, numbers and musical sounds with 4 modes of play that help’s your child learn. The only things I think are not so good with this are the need to replace batteries every month or two, but that is a small price to pay for an aspiring drummer that might end up like “John Bonham” out of the band Led Zeppelin. This unique and interesting drum with microphone set is one that stands out with a microphone and brightly lit flashing light which makes learning to play the drums fun. This can be connected to the computer so the fun lasts longer and with some timely beating, the young ones are sure to have a great time banging their little hearts out. There are 5 different modes of play, 4 alternate sound effects, 3 funky rhythms with simultaneous drum sounds. The settings are easily adjusted and there is a volume button to keep the noise down if you need things to quieten down. The 90cm microphone lead/cable makes things easy to plug-in and gets the toddler singing their latest nursery rhyme. The adjustable bracket is easy to use and adjusts for the individual heights of each child. This is sturdy drum kit comes with a 24 inch stool and is easy to play, so for those little toddlers wanting to begin learning it is ideal. This child’s drumset is one of the closest to the real thing and is designed to make them feel and look like what they see on the TV. The chord for the microphone is well-made and designed to be dragged around, which is good and a sign that Wolvol has thought thoroughly in the manufacturing process. There are loads of cool features that come with this drum. Like the others in this review, it includes melodies for timing each hit of the drumstick, music to dance to, lights for keeping the timing right and with 3AA batteries this is easy to use and maintain. The musical buttons and option are also easy to use and within 10 minutes everything from boxed will be setup and figured out. The noises are cartoon like in sound and others include bell sounds, flute, and xylophone, which is diverse for learning. The age is recommended for 3 years old and over, but I think younger children can play it and my friends as young as 2 years old use it without any issues or problems. 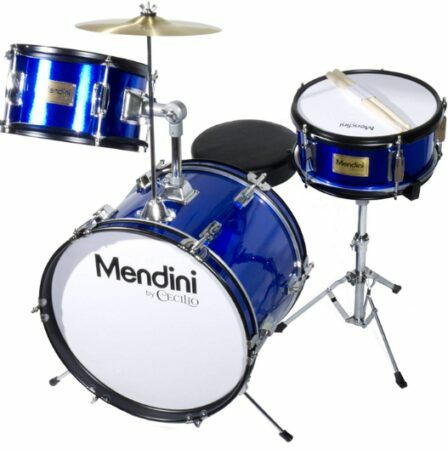 Mendini is a well-known brand and produces great drums for children of all ages, which is why the price is higher with these drums. Straight away the look is completely different from the others and this could pass for an adults version in terms of look, but looks are deceiving. This 13 inch adjustable 3-Piece drum set with a throne, cymbal, pedal & drumsticks is a standard above the rest, so if you are serious about getting them on their way, with learning the drums, then this is great for the studious toddlers with ideas of becoming the next Rock n Roll star drummer. The padded seat is the best of the stools and is easy to sit on for long periods and with adjustable features throughout this can adjust with differences in age. The bass drum pedal might be a little challenging for some smaller children, but this can easily come with a few months growth and experience. The manufacturing guidelines state for 3 years and older, but again there are loads of parents helping their younger children, with a desire to learn the drums anything is possible. This is the smallest drums in the review and ideal for those parents wanting to start their children playing the drums really young. The cartoon themes and sounds make this ideal for younger children learning to play. The bright colors are great for helping them get their colors right and is a good educational tool for teaching colors. There are over 16 sounds with different melodies that encourage them to interact with the drums. These can be easily changed and controlled by easy to use buttons. This frog drum kit has light-up colors on the drums and helps coordinate them with the timing of the music. Tapping a drum in time to a beat is a good skill to develop and the more practice the better their overall development becomes. The recommended age is 3 years old and over, but in my opinion, this could be used with younger children, however, supervision is always recommended. This is a non-toxic safe to use drum kit and the bright a friendly design makes this a great first-time buy that will encourage, educate and foster a healthy relationship with music. 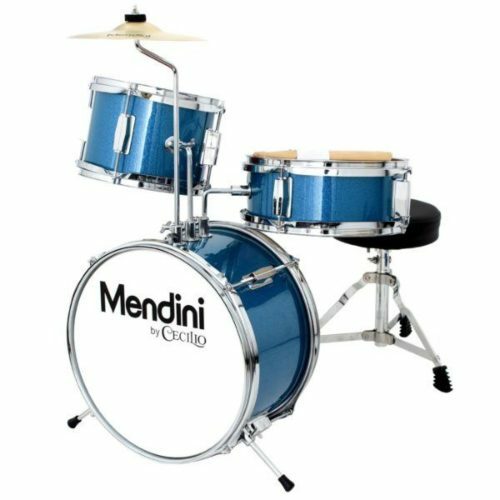 The one that stands out to me is the “Mendini drum set by Cecilio“, which has a design that is meant to get toddlers playing the drums with intent to becoming great drum players. 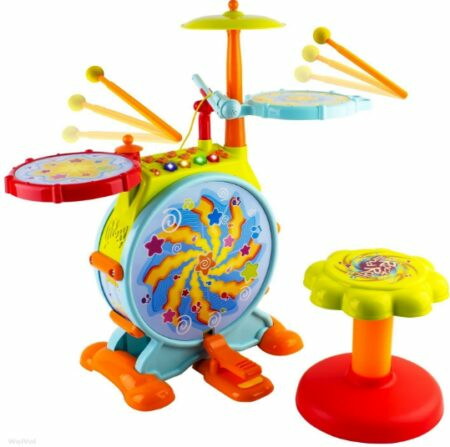 However, that being said, this is for the older toddlers and younger ones might prefer a toy set rather than an actual 3 piece drum set, because this comes with no thrills, no colorful dazzling lights, no funky melodies and is an instrument designed for parents with a goal in mind for their child’s drumming future. This is the most expensive too, so if you don’t mind the harsh reality and are willing to invest in your child’s future then this is the one that leads to stardom. The “WolVol Electric Drum Set“ is one of my favorite and for good reason, it’s cheap in price but has a good design. The microphone is sturdy and the set comes with a stool, which is why this is a great introduction for toddlers to the world of drumming. Some things to consider are the age of the child and a toddler that has just turned 1 years old has different capacities and abilities than a 3-year-old child. There is a mix of drums in this review and each one will have an age range recommendation, so you can make sure that your toddler has the right size for them. Some have manufacturing guidelines that seems a little restrictive and I will highlight when I feel they might be getting it wrong and why. 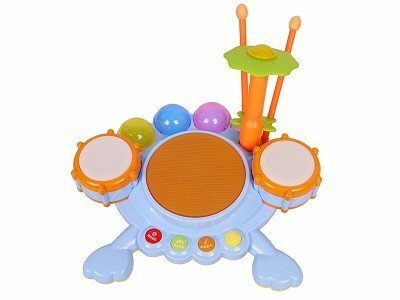 The price is also important and all of the drums in this review are under $100, which is ideal for a young toddlers because whether they will be interested in continuing playing drums after the initial excitement of something new is unsure. The benefits of playing the drums for children are great and any musical instrument comes highly recommended, but personally the drums I like. My boys, I find they have loads of energy and finding ways to release can be challenging, but drums can help and actually tires them out, which is great. A lot of children’s drums come with color coded drums so they can learn very easily. This is good and helps strengthen their colors while coordinating and timing patterns for playing. The basic drummer needs to learn how to space and time each hit of the drumstick, which is challenging but also great when combined with learning the alphabet. Playing in time is an essential skill, it is transferable into other areas of day to day life and with each new skill learned they will become more creative. Creativity is very important to cultivate early on in a child’s life. There is a lot of scientific evidence suggesting that if young children learn music they will develop healthy patterns in the brain. The imagination is crucial to develop in toddlers especially and playing music enhances creativity in the imagination, which enhances their focus, brain development, and well-being as they grow all the way through into adulthood. How to know if your child is ready? This is a frequently asked question and there are different views, but it is my belief that children as young as 1 years old can learn to play the drums. Some parents worry that their child is too young, but my answer is to spend some time with them and show them some basic techniques. This will encourage and make them want to impress you through practice which is the foundation for their learning. Children drum sets come with manufacturing guidelines and these should always be looked at and sought for guidance. However, personal discretion is also ok, some parents that take the time to help step-by-step learning can also purchase with a different intent because they are willing to sit close and act like a tutor, which keeps things safe.